Changes to rules in the energy sector could have ramifications across the UK economy, according to business lobby group the CBI, so it is extremely important that it remains as close as possible to the EU. That contrasts with specific sectors such as agriculture, shipping and tourism where divergence will be beneficial. In addition, the CBI said the benefits of the UK’s membership of Euratom should be maintained (whether through continued membership or new arrangements), and the UK should ensure full participation with the EU Emissions Trading System until the end of 2020, with at least equivalence thereafter. Lawrence Slade, Chief Executive of Energy UK, said: “In order to keep costs down for UK customers and businesses, maintain security of supply and meet our climate targets it will be essential for the future EU-UK agreement to maintain a close trading relationship in energy. “The Internal Energy Market is a collaborative project with a long-term vision. It has delivered clear benefits to EU and UK customers and is vital in supporting the Single Energy Market on the Island of Ireland. The CBI report points out some rules affect the entire economy. It says employment rules, standards, state aid, public procurement and especially data flow must maintain consistency between the UK and EU. 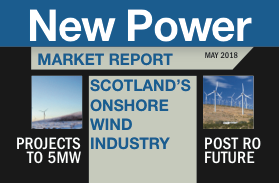 Onshore wind: an industry for a post-Brexit UK?